Japan's most famous mountain is Mt.Fuji. There are eight springs at the foot of Mt.Fuji called Oshino Hakkai. These fountains were gushing with snowmelt of Mt.Fuji, as well as being certified as a natural treasure of Japan, has been elected to the hundred best natural waters in Japan. Oshino Hakkai at the foot of Mt.Fuji, as well as a beautiful spring, also known as spot overlooking the landscape of Mt.Fuji. 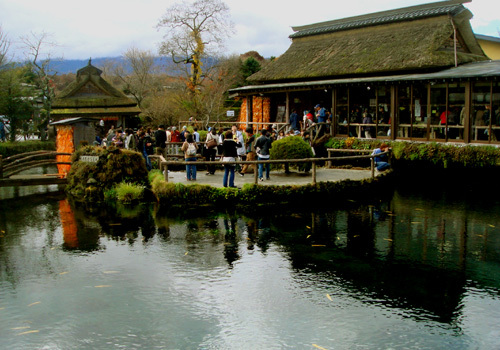 The pond is lined with traditional houses, you can feel the atmosphere of old. Incidentally, these old houses is both a souvenir shop. Many travelers, it has been developed as a tourist destination, and the landscape may be different from the photograph to imagine. However, tofu made ​​with spring water, etc., so interesting items are sold, I will also enjoy shopping. You can take a taxi or bus from Mt.Fuji station of the Fuji Kyuko Co., Ltd., is more convenient to use the car rental or tour.